Using data from patients who had important arrhythmias identified during the index visit in the above study and additional patients recruited at the above 6 EDs, we assessed the incidence and timing of arrhythmia occurrence. We analyzed data from 5,581 patients and found that 0.4% of low-risk patients, 8.7% of medium-risk patients and 25.3% of high-risk patients suffered 30-day arrhythmic outcomes. 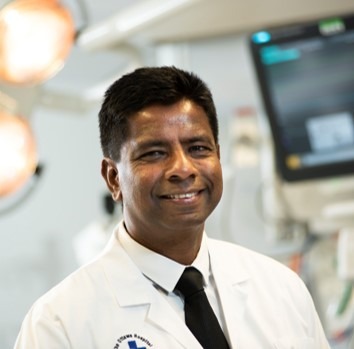 One-half of arrhythmic outcomes were identified within 2 hours of ED arrival in low-risk and within 6 hours in medium and high-risk patients and the residual risk after these cut-points were 0.2% for low-risk, 5.0% medium and 18.1% high-risk patients. Overall, 91.7% of arrhythmic outcomes among medium and high-risk patients including all ventricular arrhythmias were identified within 15-days. None of the low-risk patients suffered ventricular arrhythmia or unexplained death while 0.9% medium-risk and 6.3% of high-risk patients suffered them (p<0.0001). Serious underlying arrhythmia was often identified within the first 2 hours of ED arrival for CSRS low-risk patients, and within 6 hours for CSRS medium- and high-risk patients. Outpatient cardiac rhythm monitoring for 15 days for selected medium-risk patients and all high-risk patients discharged from the hospital should also be considered. The Pulmonary Embolism in Syncope Italian Trail (PESIT) only enrolled syncope patients who were hospitalized and reported an exceptionally high PE prevalence, advocating PE investigations for all patients with syncope. We combined data from two large prospective syncope studies enrolling adults with syncope from 17 EDs in Canada and the United States. Of the 9,091 patients, 56 patients (prevalence 0.6%; 95% CI 0.5% – 0.8%) had PE identified within 30-days of index syncope of whom 7 (0.1%) were diagnosed after the index visit. Of the 86 patients (0.9%) who died within 30-days, 4 (0.04%) were related to PE. Only 11 patients (0.1%) with a non-PE serious condition had a concomitant PE. The prevalence of PE is very low among ED patients with syncope, including those hospitalized following syncope. While an underlying PE may cause syncope, clinicians should be cautious against indiscriminate investigations for PE. Upon initial evaluation of the syncope patient, if you are certain as to the cause of the patient’s syncope, then manage the patient based on the identified etiology. 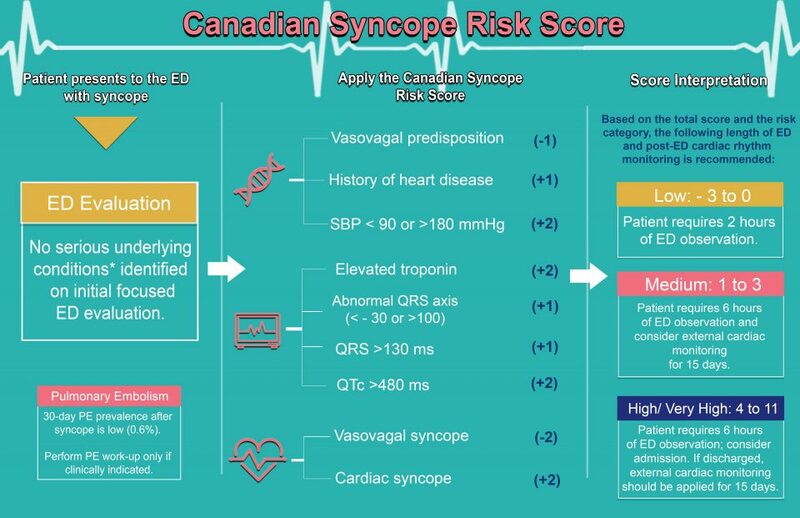 At the end of ED evaluation if no serious underlying conditions were identified as the cause of syncope, then utilize the Canadian Syncope Risk Score to estimate the risk of serious adverse event in the next 30-days. The serious adverse events include conditions that need to be detected (MI, structural heart disease, bleeding, pulmonary embolism) and those that need to be predicted (arrhythmia, death). If the patient is deemed medium or high-risk as per the score, it is imperative to carefully evaluate the patient and conduct further investigations as required. If you are confident that all serious conditions that need to be detected are reasonably unlikely, the one remaining etiology is arrhythmia, which may be difficult to detect in the ED. If they are at risk for ventricular arrhythmia (likely risk factors include CHF with poor ejection fraction, cardiomyopathy, cardiomegaly, wide QRS, prolonged QT, significant cardiac abnormalities – Brugada, HOCM etc.) then the patient should be admitted. If the patient is high-risk for arrhythmia, but ventricular arrhythmia is less likely, they may discharge home with a prolonged monitoring device. Outpatient cardiac rhythm monitoring for 15 days for medium-risk patients should be considered and all high-risk patients discharged from the hospital is recommended. If there is a high suspicion for significant pathology (i.e. early sepsis, occult GI bleeding), admission of the patient is strongly suggested. Results of the score validation; 30-day probabilities of death, arrhythmia including ventricular arrhythmia, and non-arrhythmia for each CSRS risk categories, and clinical recommendations based on the above probabilities soon to follow. Venkatesh T, H. RB, L.A. SM, et al. Duration of Electrocardiographic Monitoring of Emergency Department Patients with Syncope . Circulation. 2019;0(0). doi:10.1161/CIRCULATIONAHA.118.036088. Thiruganasambandamoorthy V, Kwong K, Wells GA, et al. Development of the Canadian Syncope Risk Score to predict serious adverse events after emergency department assessment of syncope. 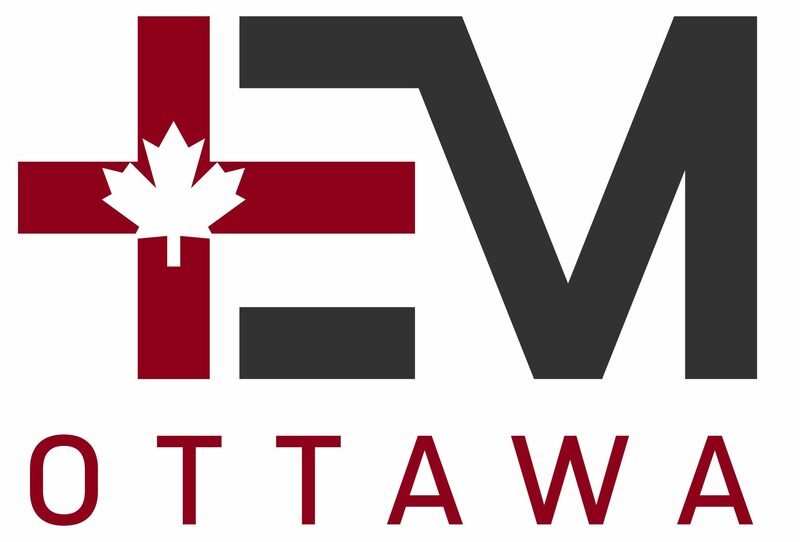 Canadian Medical Association Journal. July 2016. doi:10.1503/cmaj.151469.